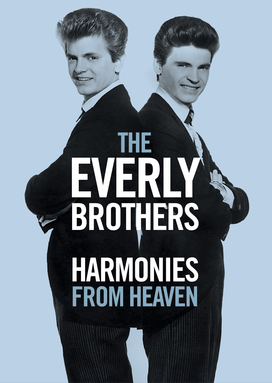 New York (August 1, 2016)— Eagle Rock Entertainment uncovers the story behind the Everly Brothers, with the 2DVD, DVD+Blu-ray, and Digital Format release of documentary film Harmonies From Heaven on September 9, 2016. This new Everly Brothers documentary, which was broadcast on BBC4 earlier in the year, contains additional bonus interviews not included in the broadcast version, along with a DVD of a previously unreleased live performance recorded for Australian TV at Chequers Nightclub in 1968. This never-before-seen concert footage includes incredible live versions of “Bye Bye Love,” “Cathy’s Clown,” “Wake Up Little Susie,” “Bird Dog,” “(Til) I Kissed You,” “So Sad (To Watch Good Love Go Bad),” “Let It Be Me,” and more! Harmonies From Heaven tells the story of Phil and Don Everly, focusing on the heyday of their careers in the fifties and sixties. Featuring new interview footage with surviving brother Don and archive interviews with Phil, the film follows their career from child performers on their father’s radio show, through their move to Nashville and their relationship with publishers Acuff-Rose. The DVD specifically delves into their relationship with the songwriting team of Felice and Boudleaux Bryant, who provided many of their early hits, including their first million-seller “Bye Bye Love”. Harmonies From Heaven also features interviews with those inspired by the Everly Brothers, including Art Garfunkel, Keith Richards, Graham Nash, Dave Edmunds, Tim Rice, Albert Lee, and Waddy Wachtel, and highlights their influence on younger generations of artists with English musician/singer-songwriter Jake Bugg (who punctuates the film with two exclusive acoustic performances of classic Everly Brothers songs). Blending the amazing story of the Everly Brothers with previously unseen performances and fascinating interviews, Harmonies From Heaven is an incredible study of the influence and musical magic behind these famed brothers.